[phi,w] = phasez(sysobj) returns the unwrapped phase response phi of the filter System object™, sysobj, based on the current filter coefficients. The vector w contains the frequencies (in radians) at which the function evaluates the phase response. The phase response is evaluated at 8192 points equally spaced around the upper half of the unit circle. [phi,w] = phasez(sysobj,n) returns the phase response of the filter System object and the corresponding frequencies at n points equally spaced around the upper half of the unit circle. [phi,w] = phasez(sysobj,'Arithmetic',arithType) analyzes the filter System object, based on the arithmetic specified in arithType, using either of the previous syntaxes. 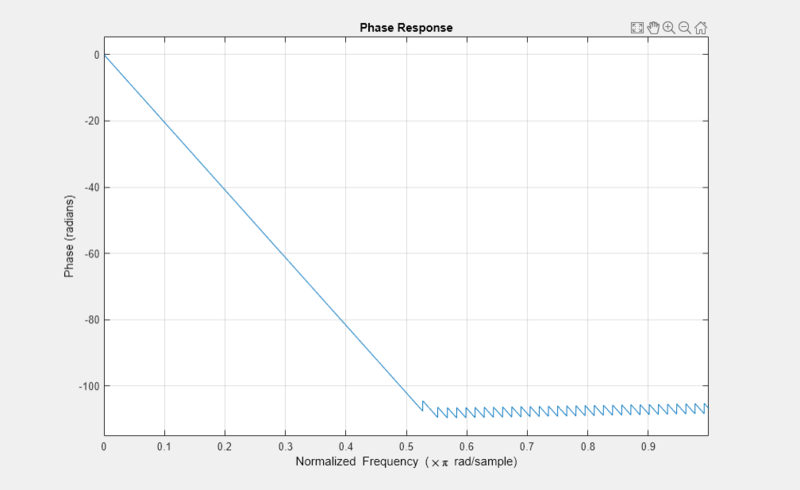 phasez(sysobj) displays the phase response of the filter System object sysobj in the fvtool. For more input options, see phasez. Phase response vector of length n. If n is not specified, the function uses a default value of 8192. The phase response is evaluated at n points equally spaced around the upper half of the unit circle.